Evie loves being a healer, but the day her assistant, Wormy, decides to propose to her changes her life forever. Fairy Lucinda shows up at the proposal and is furious when Evie turns down Wormy and decides to curse Evie. 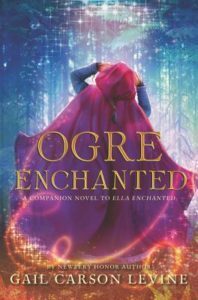 Next thing Evie knows, she is an ogre and has sixty days to find someone to propose to her or else she will be an ogre forever. On her journey Evie learns what love is and what it means to be a true friend. Yay! A new book by Gail Carson Levine! Sounds like a great one. I can’t wait to read it and pass it on to students! I was looking at this book earlier and after reading your review, I think I’ll read it. Thanks.